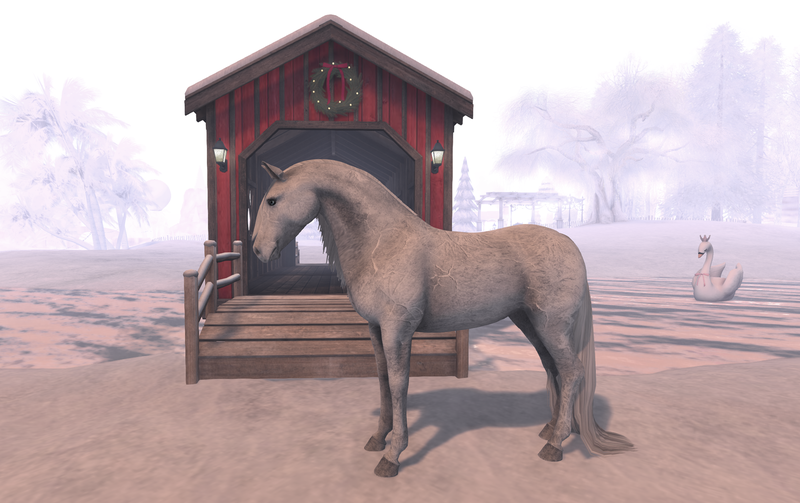 The Water Horse sim underwent a huge renovation over the past few days, and it’s now open to the public again! It looks a lot better and more professional than it did, with separate buildings for the avatars, riding horses, and animesh horses (coming soon). Plus multiple riding rings and trails to explore. All creators’ shops are now in a big circle instead of streets, which should give everyone equal exposure and be easier to find. Speaking of which, my shop has a new landmark there — come visit and check out the redesign! Added another creature to my texturing list — the Shadowfury dragon mod from Blue Pearl! The creator asked me a few weeks ago if I’d like to make some skins for her animals, and I of course said yes — and knew my first one would be the Shadowfury. The default skin is pretty much the same as the one in How to Train Your Dragon, so I wanted to completely depart from that and make something new (with scales). The result was a deep blackberry color I decided to name Dragonberry! In the new year I’ve decided to start making textures for the Teegle Horse as well as Water Horse! These will work with both the Teegle avatar and the new animesh Teeglepet that’s coming out soon. Update: The Frozen Body Coat & Hooves below are also available! Process-wise, the UV map for Teegle is different than Water Horse (of course), so it takes a bit of finagling & reworking. But no eyelid or HUD textures to worry about, and the horse comes with a built-in shine slider, so you don’t need to create a specular layer. The applier creation steps are also a 180 from WH — no copying UUIDs and editing code (mostly dragging scripts into a cube & following their instructions). The only negative I’ve run into is the applier scripts don’t always function if I need to fix something after hitting the “finish” button. Anyway, I love the expressiveness of the Teegle and its emotions & animations, and am looking forward to the Teeglepet release. I just wish the gait sounds were in sync with the hooves hitting the ground!